Our Las Vegas and Henderson locations offer CBD Gel Capsules for our customers. Come by or contact us our knowledgeable staff to help you pick the right Lenitiv CBD capsule formula for you. Lenitiv has developed a highly innovative and consistent line of 100% hemp CBD products using the latest manufacturing technologies. Available in gels capsules and oil, there is something for everyone. The Dispensary NV happily carries Alert and Relax 50mg capsules at the Las Vegas and Henderson locations. Lenitiv Alert CBD capsules are made 100% derived from hemp and contain absolutely no THC. Alert is designed to be taken in the morning as a way to start your day. Alert has terpenes listed as the third main ingredient and is known to aid anxiety and depression, help manage pain and promote memory retention as well as alertness. Lenitiv Relax CBD capsules are also made with similar ingredients to Alert. Made with 100% hemp and zero THC, Relax is best to take when winding down at night. Terpenes are also listed as a main ingredient and help to promote relaxation, ease anxiety and insomnia and even act as an anti-inflammatory. Both Alert and Relax capsule come in packs of 30 servings. 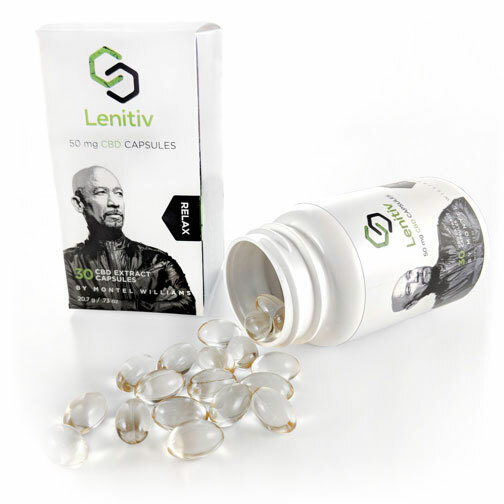 Media personality and well-known cannabis advocate, Montel Williams is the founder of Lenitiv Scientific. After being diagnosed with Multiple Sclerosis in 1999, the decorated and retired Naval Officer has used cannabis products to help manage his MS symptoms. Williams has also mentioned that cannabis has saved him from suffering from opioid addiction. Why CBD? CBD has been proven to be medically more effective compared to its THC counterpart. CBD indirectly affects the body’s cannabinoid receptors, meaning the consumer will not get the dazed and euphoric high that they are accustomed to with THC. Williams has been a key player for medical marijuana reform in New York, New Jersey, Ohio and other states. He has also helped lead the way for military veterans to gain access to medical marijuana, without the worry of losing their benefits. For more information on the Lenitiv products and to find out which is right for you, visit our team at our Las Vegas and Henderson dispensary locations.